Hello! Today I am sharing a few fun twists on the partial die cutting technique. I also show how to create soft, ink blended backgrounds. I have done many videos on partial die cutting in the past (see below), but today I share a few variations that are great for large dies. For my first card, I used double partial die cutting with the Spellbinders June Large Die Of The Month to create a large die cut with a solid section for my sentiment. (Watch the video to see how this is done!) I then stacked four more regular die cuts behind it for dimension. The sentiment is from the Hero Arts You’re Beautiful Stamp Set (SSS | HA). I also used double partial die cutting for this next card… but this time with the Spellbinders Floral Mandala Die (SSS | SB). The sentiment is from the Simon Says Stamp Beautiful Flower Stamp Set. You can also use partial die cutting at an angle. Here, I used the other Spellbinders June Large Die Of The Month (they are sold as a pair). I love this look! The sentiment is again from the Hero Arts You’re Beautiful Stamp Set (SSS | HA). Since I had tiny cut pieces of die cuts left over from the last card, I made this card quickly. I just adhered the pieces around the edge of an inked piece… and added a Gina K Designs Lettered and Lovely (SSS | GK) sentiment to the center. I have another bonus card for you! No partial die cutting on it… but I do show something fun you can do with stacked die cuts. Here, I layered five of Spellbinders Kurbits 2 Die (SSS | SP) together and added it to an inked background. I filled in each of the openings with Tonic Crystal Glaze… giving a stained glass look. This sentiment is perfect… from the Simon Says Stamp Beautiful Flower Stamp Set. Partial die cutting around a stamped image. Partial die cutting on a zig zag fold card. The two main floral dies I used today are part of the Spellbinders Large Die of the Month for June. You can learn more about this HERE… it is a great deal! There are actually a few different “clubs” over at Spellbinders offering unique products at good prices. You can see them all HERE. You can even get discounts on other products! Want to find the products I used? I have listed them below. (Compensated affiliate links used at no cost to you. Thank you! Affiliate and product disclosure can be found here. All products were personally purchased except those with an asterisk or from Spellbinders. As always, this post was NOT paid for or sponsored.) Click on the icons below each product picture to go to a favorite store. Love the close-up of your cards especially the card with the left over die cut flowers…….wasting nothing. Thanks Jennifer,I’ve always loved partial diecutting. Thanks so NN==much FOR SHARING THIS TECHNIQUE tHESE CARDS ARE ALL STUNNING!! 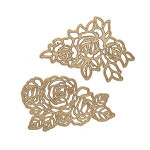 These are so beautiful and a great reminder to do partial die cutting. Thanks for the tips Jennifer, much appreciated. Beautiful cards. I always enjoy your videos! I haven’t tried this technique nor have I tried making multiples of dies and stacking them. I’ll certainly give this a try after being inspired by your examples! The cards you made are just gorgeous. Thanks for sharing. Beautiful cards and an awesome technique. Thanks for the informative and creative tutorial. What beautiful cards! Thank you for more great ideas. I haven’t tried partial die cutting yet, but it’s on my to-do list because it really adds that extra “oomph” to a card. Thanks for the great video! Absolutely love these cards, Jennifer! I really need to do partial die cutting more often–you’ve inspired me! That spray glitter is my favorite! However, last time I used it I had trouble getting a nice even finish, so may need to buy another can. Thank you for all the great ideas! Your cards are beautiful. Thanks for your videos. Fantastic cards, as usual ! I love the idea of the crystal glaze added inside the stacked die cuts, it’s really different. Thanks for another fantastic video packed with great cards and instruction. Awesome, Jennifer you have always such great ideas. I love the way you stretch your dies in this way. Lovely cards, all the same technique but all different looks. Thank you so much for your tutorial video. What type of cutter are you using and where did you purchase it? These are all beautiful and I’m pretty sure I have some dies that can be used in this way. Thanks! Jennifer…so pumped about this video! I have lots of ornate Spellbinder dies that I can use to try this technique!! The colors you get are so bright and vibrant. Love the technique learned. Wow! These are fantastic!! I should definitely try them out! Fantastic! Beautiful cards! Always something fresh and new and you’re such a dear to share it all with us! I love that glitter spray! WOW! WOW! Beautiful cards. Thank you for the great tips. I know what I’ll be doing this weekend. I have a number of spellbinders dies and wasn’t sure what to do with them. I know now! Making a few of those partial die cut cards. Brilliant. Love them so much. You sure are an inspiration to all of us. These cards are beautiful. Gave me some wonderful tips for my large floral dies from Spellbinder’s. I really like how you did the top and bottom half by partially cutting them out which makes it so easy. Your last card was really exceptional. Love the Tonic Chrystal glaze to fill in the spaces. Great tips, thank you. Gorgeous! I love using scraps too. The chevron card is stunning – love the colours you used. Fun way to use the diecuts in different ways! Your cards are all so pretty! Thanks for sharing them and all the tips. Great idea on those dies that you think are only for one use. I love this fun idea and that last card with the clear glossy really makes an awesome look. So inspirational. I love that you think outside of the box and pass it on to us.. Thank you for tons of advice in this video, the cards are stunning and so unique. I have a question of anyone can answer it please: Which do you do first, ink up the background panel then put sentiment on for embossing or visa versa as I don’t want to ruin either bit ? Thank you for sharing another AWESOME way to stretch your supplies! LOVE!! Jennifer I love all of these softly blended color cards. The colors are so soothing and die cuts are so intricate – so glad you share your tips and tricks with us in these great videos! Thanks! Jennifer, you always come up with fantastic ideas for stretching our supplies while making phenomenal cards and the techniques you demonstrated here are no exception. I recently received my July dies from Spellbinders and will definitely be using them to give this technique a try. Thanks! Thanks for doing this blog. I learn something every time I read here.